Acacia cardiophylla – The Wyalong Wattle. 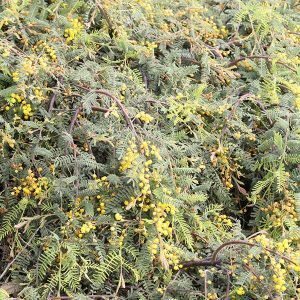 Generally a low growing species Acacia cardiophylla is commonly known as ‘The Wyalong Wattle’. Attractive yellow flowers and fine feathery foliage make this a useful low care landscaping plant. It is a variable species and depending on the form can reach to 4 metres in height. The form ‘Gold Lace’ seems to be the most reelable a low growing form, reaching less than .5 metres in most situations. Evergreen and naturally spreading, it is a plant that has a natural weeping habit, that seems to always be wider than it is tall. Growing well in full sun and coping well with dry conditions this is a tough and hardy plant for native gardens and broader landscaping uses alike. When in flower from spring through to summer, this is great plant for attracting bees, birds and butterflies to the garden, the taller forms also act as a habitat plant. Best grown in an open sunny position in a well drained soil. Once established this is drought tolerant low maintenance plant. Fertiliser is not often needed as the plant copes with poor soils. A little slow release native plant fertiliser can be used in spring if desired.